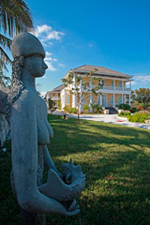 Nassau, Bahamas - The National Art Gallery of The Bahamas (NAGB) presents the sixth biennial exhibition, NE6, showcasing contemporary artists of Bahamian descent or those living and working in The Bahamas today. Under the new directorship of Amanda Coulson, this year’s edition changes format and, instead of an open call, becomes a themed exhibition, entitled “Kingdom Come,” to which artists, selected by the NAGB’s Chief Curator, John Cox, are invited to participate. 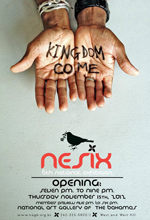 The NAGB is pleased to announce the public opening of NE6: Kingdom Come on Thursday, November 15th, 2012 at 7PM. Belief systems tend to work best when they are isolated, uncontested by any other canon; this could be why religious scholar and philosopher Joseph Campbell, describes ‘The End’ as a kind of collision of once disparate ideologies. This year’s edition of National Exhibition, “Kingdom Come,” provides 50 visual thinkers with a practical platform on which to collide with their vision of our present confusion or with hopeful projections of new beginnings. 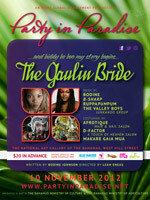 Nassau, Bahamas - Another avenue of Bahamian Art and Culture will be explored when Party in Paradise presents The Gaulin Bride. 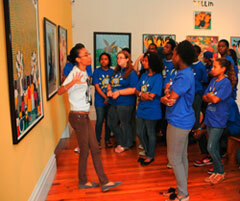 The event will be staged at The National Art Gallery of The Bahamas on West Hill Street, November 10th, 2012. Party in Paradise, held in conjunction with Ivory Global Management is a new spin on a vintage idea. 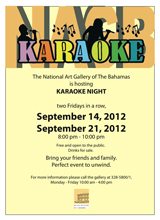 Nassau, Bahamas - Back by popular demand The National Art Gallery of The Bahamas is hosting Karaoke Night AGAIN on FRIDAY, September 14th, 2012 AND Friday, September 21st from 8PM to 10PM . The event is free and open to the public. Refreshments will be served + drinks will be on sale. 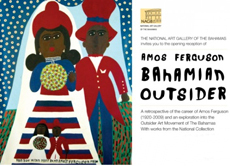 Nassau, Bahamas - Sunday, October 28th, 2012 is the last day to catch “Amos Ferguson: Bahamian Outsider,” the National Art Gallery of The Bahamas (NAGB)’s first large scale Amos Ferguson exhibition. The show has been running since May 24th, 2012. Have you ever questioned photography as an art? Ever wondered how to become a photographer? Are you interest in photography as a career? Interested in fashion, modeling and capturing everyday life events? 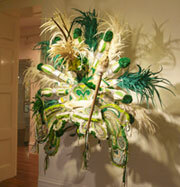 Nassau, Bahamas - There is a party at the National Art Gallery of The Bahamas. 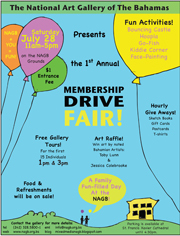 The National Art Gallery of The Bahamas will be hosting its first annual Membership Drive Fair on Saturday, July 28th , from 11 AM to 5 PM. Nassau, Bahamas - The National Art Gallery of The Bahamas is pleased to continue its NAGB Film Series with a double feature (2 films in one day). 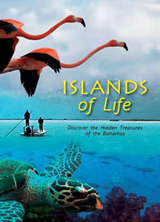 On Thursday, July 12th, 2012 at 8pm, The Tall Tale of An Accidental Tourist will be shown, followed by a documentary film at 8:30pm in conjunction with The Bahamas National Trust called, Islands of Life. 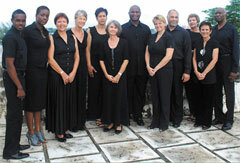 Nassau, Bahamas - The Nassau Chamber Ensemble is pleased to present its third concert, an afternoon of delightful Baroque, Classical and Romantic Chamber Music to be held at the Bahamas Historical Society on Sunday, 10th June 2012 at 3pm. It is hoped that everyone interested would be able to attend this delightful event. Refreshments will be served. The National Art Gallery of The Bahamas (NAGB) is pleased to be staging a large-scale retrospective of one of the masters of the Bahamian art scene: Amos Ferguson. Born in Exuma in 1920 and passed away in Nassau in 2009, Ferguson is well known beyond the Bahamian shores for his brilliantly colored scenes of Bahamian life and illustrated Bible stories. Aptly entitled "Bahamian Outsider," this show aims to firmly establish this self-taught artist into the firmament of great Bahamian and international artists. 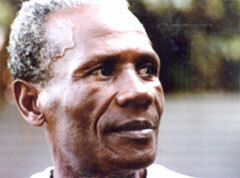 Nassau, Bahamas - You're invited to NAGB FIlm Series: A Beat Forever, Junkanoo Produced By: Isabella Astengo Date: 7:00 pm, Thursday, April 26th, 2012. Nassau, Bahamas - You're invited to Junkanoo Dance and Music Workshop. The National Art Gallery of The Bahamas is going to “dance to the Junkanoo”, “shake to the Junkanoo” and “jump to the Junkanoo”. Everybody join NAGB in a dance and music workshop. Learn either Junkanoo choreography or the musical instruments that make it all happen. Nassau, Bahamas - You're invited to Junkanoo Pasting Workshop. 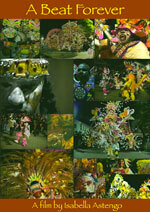 Join The National Art Gallery of The Bahamas in an educational celebration of Junkanoo on Saturday, April 21st, 2012. 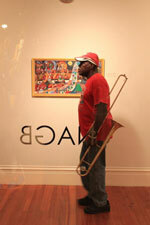 “A must-see for anyone seeking to understand what Junkanoo is all about,” Nicky Kelly –The Tribune. 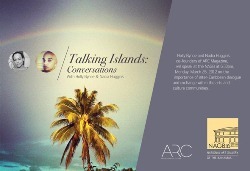 Nassau, Bahamas - You're invited Talking Islands: Conversations with ARC Magazine's Holly Bynoe and Nadia Huggins Monday, March 26th at the NAGB At 6:30pm. 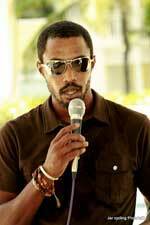 Nassau, Bahamas - The Education Department of the National Art Gallery of The Bahamas has chosen Bahamian filmmaker Calvin Harris' film “On the Wings of Men” to be the first in a series of films under the current exhibition, “As We Knew Him," One Family’s Tribute to Jackson Burnside III. The film will be screened on Thursday, February 23rd at 7pm at the NAGB. Nassau, Bahamas - The National Art Gallery of The Bahamas is pleased to announce that we have extended our hours to allow the Bahamian public and our international visitors more opportunities to engage and experience our wonderful Gallery and the art within. 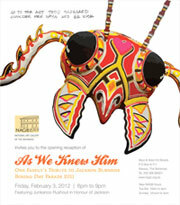 Nassau, Bahamas - National Art Gallery of The Bahamas invites you to the opening reception of As We Knew Him One Family's Tribute to Jackson Burnside Boxing Day Parade 2011. Friday, February 3rd from 6pm to 9pm. 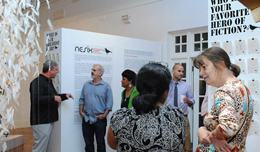 Nassau, Bahamas - On January 1st, 2012, John Cox, the founder of the artists’ cooperative Popopstudios International Center for the Visual Arts, took on the position of Chief Curator at The National Art Gallery of The Bahamas, appointed by incoming Director, Amanda Coulson.